Updated Sunday March 17, 2019 by Kanata Baseball Association. 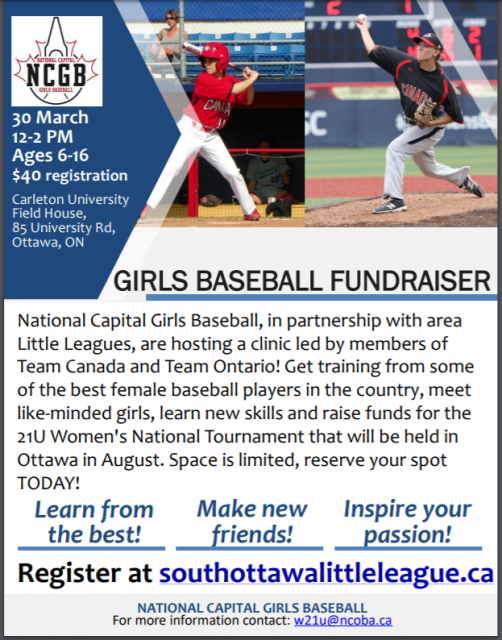 This clinic is presented by National Capital Girls Baseball (NCGB) and supported by local baseball organizations including area Little Leagues. Leading the clinic are local female baseball players including members of Team Canada and Team Ontario Hannah Martensen, Jenna Flannigan, Tess Forman, Elizabeth Plamondon, Maylee Matchett, Amber Flannigan. $40.00 registration fee. All proceeds go to support the U21 National Women's Championships being held in Ottawa August 1-4, 2019. Registration is open to girls age 6 and 16 who live anywhere in the Ottawa and surrounding area. Space is limited to 50 girls. All skill levels are welcome - including girls new to the game. Participants are asked to bring a glove and batting helmet. All other equipment including bats are provided. We will have a small supply of extra gloves and helmets available if needed. Please wear running shoes or rubber cleats and comfortable clothing such as track pants or baseball pants. "Where will the Clinic be held?"